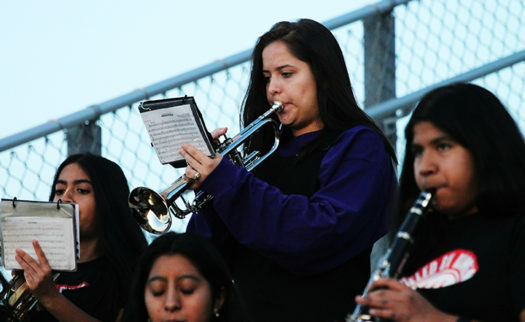 Sedona Whitehead plays with the Brigade at a playoff game. According to her friends, freshman Sedona Whitehead is not like the other kids at this school. To them, her kind personality sets her apart from the crowd. Whitehead is the quartermaster for the Bison Brigade. Her responsibilities as a quartermaster include doing things such as keeping up with band equipment and helping make sure everything is accounted for. Whitehead is also involved with theatre. Whitehead is known for her love of music, even by people who don’t necessarily know her. Whitehead is known for being outspoken; however, according to her friends, it is in the best way possible.